SYDNEY, (Reuters): Ed Cowan will open the batting on his debut for Australia in next week's first test against India after being included in an extended a 13-strong squad announced on Wednesday. Australia blooded three new caps in this month's series against New Zealand and Cowan will ensure a fourth at the Melbourne Cricket Ground, with all rounder Dan Christian a possible fifth if Shaun Marsh fails to prove his fitness. Left-hander Cowan has been in fine form for Tasmania this season and scored a timely 109 against India in the ongoing three-day tour match in Canberra on Tuesday. "Ed Cowan's very good form has been compelling in him being included in the side ... and the intention is he will open the batting with David Warner," chief selector John Inverarity told a televised news conference in Perth. "I think in the side we're looking for a bit more steadiness and we're looking to Ed to provide that," he added. "The stars are aligned for Ed." Pace bowlers James Pattinson and Mitchell Starc were handed their baggy green caps with Warner ahead of the opening test against New Zealand earlier this month and all three were retained for the first of four tests against India, which starts on Monday. Opener Phil Hughes, as expected, lost his place in the team after a miserable series against the Black Caps and Usman Khawaja also paid the price for repeated failures with the bat. "They are young players who we consider still to be very promising and we look forward in the future to them pushing strongly for inclusion in the side," Inverarity said. A lower back injury to top order batsman Marsh, rated as "unlikely" to be fit only last week, forced selectors to name uncapped Christian as back-up. "It was always anticipated that when Shaun started to feel better, it would be quite a rapid improvement and that is what has happened over the last day or two," Inverarity said. 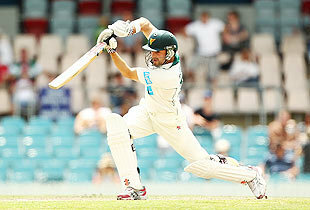 "It's likely if Shaun plays that he'll be batting at number three and if Dan Christian plays he will be at number six." All rounder Shane Watson and paceman Ryan Harris were not considered because of injury, the former with calf and hamstring problems and the latter because he has yet to bowl enough to prove his fitness after being dogged by knee injuries. "Shane Watson is not fit to play (but) we hope he will be in contention for the second test in Sydney," Inverarity said of Australia's player of the year for the last two seasons. Dependable quick Ben Hilfenhaus has been recalled and will vie with Starc for the spot as the third quick in the side behind Peter Siddle and Pattinson. Batsmen Ricky Ponting and Mike Hussey retained their places in the side despite being under pressure after mediocre performances against New Zealand, who won their first test on Australian soil in 26 years earlier this month.